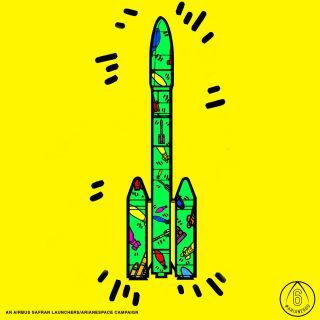 The campaign logo for the Airbus Safran Launchers and Arianespace contest MyAriane6. The grand-prize winner will receive an all-expenses-paid trip to see the launch of an Ariane 5 rocket in French Guiana. An online contest will give one lucky winner a free trip to French Guiana to see the launch of an Ariane 5 rocket. The online contest, called MyAriane6, is hosted by the satellite launch provider Arianespace, along with Airbus Safran Launchers, who manufacture the Ariane 5. The grand-prize winner will receive airfare and accommodations to see an Ariane 5 launch in 2017. Additional prizes include trips to France to meet the teams behind the Ariane 6 rocket, which is scheduled to make its first launch in 2020. To enter, participants need to post an image on Instagram that illustrates "what Ariane 6 means to them — whether that means better telecommunications, a closer relationship with space, improved geolocation, a boost to the economy or simply the innate excitement that exploring the unknown evokes," according to a statement from Arianespace. Arianespace currently oversees launches of three space vehicles from its launch site in French Guiana: the Ariane 5, the Soyuz cargo vehicle (made by the Russian space agency, Roscosmos) and the Vega, developed by the Italian and European space agencies. The Ariane 6 will succeed the Ariane 5 as the company's heavy-lift launcher. The James Webb Space Telescope, a successor to the Hubble Space Telescope, is scheduled to launch aboard an Ariane 5 in 2018. "Entries must include the contest hashtag (#MyAriane6), the campaign hashtag (#Ariane6GO), as well as a location hashtag to tell where they are participating from (ex. #Ireland), and users must follow @Arianespace and @ASLaunchers — and be above 18 years of age — in order to be eligible," the statement said. The complete contest rules, regulations and other prizes can be found here.